Oooh, the days of lying out for hours in the 115+degree, Arizona heat, by the pool (aka: life force) with my enormous bottle of water, towel, magazine and NO sunscreen are…long over (hey, don’t judge me…at least I didn’t use aluminum foil and baby oil)! Thankfully, those crazy days of attempting to get that sun-kissed glow which, for me, was more like a sun-kissed pomegranate are fini! I don’t care how ‘dry’ the Arizona heat is…it’s hot and can be lethal; they didn’t create a town called Death Valley for nothing (it’s in California, but close enough). Much like cigarette smoking decades prior, if everyone is doing it, it must be safe – right? Wrong! And, the distant memory of excruciating, post-sunbathed pain is proof positive. Having ceased that bad habit many years ago, I simultaneously swapped it for another culprit when I started using sun protection that was loaded with toxic chemicals (again, don’t judge because chances are you are using one of them right now). As Maya Angelou says, When you know better, you do better. It’s really as simple as that. Now, I know better (and after reading this, you will too)! Along my journey towards optimal health, I have come across a ton of so-called natural, safe and non-toxic sunscreens (some of which rose to the occasion and others that sank like quicksand). We are thrilled to introduce you to an amazing line of sunscreen products by Goddess Garden that literally soars to the occasion. There are a plethora of features that make this line one of a kind when it comes to top notch sun protection. The first, being the unique features that differentiate it from conventional sunscreens. Conventional sunscreens rely on chemical ingredients to absorb the sun’s UVA and UVB (ultraviolet) rays. These chemicals are absorbed by the skin and have been shown to cause hormone disruption and can break down over time into free radicals (which may cause skin cancers). Natural sunscreen, like Goddess Garden, uses only natural ingredients and minerals to block the sun’s rays. The second, being that it contains the highest organic content on the market! Don’t take our word for it. Check out what The Environmental Working Group and Dr. Oz have to say! Finally, other benefits include that it’s comprised of 100% natural ingredients and is continuous spray sunscreen; the FIRST and ONLY non-aerosol, natural sunscreen on the market. If you are looking for the safest and most effective spray sunscreen…meet your new BFF! After all, it was created by a mom who wanted the best for her children. Watch her story HERE. Not one…but two of our lucky readers will WIN: (2) Continuous Spray Sunscreens (One Adult + One Kids), (2) Trigger Spray Sunscreens (One Adult + One Kids), and (1) Facial Sunscreen (ARV $108.00)! A leader in premium natural sunscreen with the highest organic content on the market (92% certified organic). Made from all natural ingredients like plant based oils, essential oils and natural rock minerals…that’s it! Their new continuous spray sunscreen is the FIRST and ONLY non-aerosol, natural sunscreen on the market. Uses only natural minerals, zinc oxide and titanium dioxide, to provide SPF 30 protection. Contains no synthetic ingredients or chemicals. Is effective in blocking sun immediately vs. conventional sunscreen which must be applied 15-20 minutes before sun exposure to see results. Is biodegradable and reef safe. Is vegan. No animal products are used in our formulas, and all products are cruelty free as well. Does not use nano-particles since all of their minerals are larger than 100 nm (nanometers). Founded by “mompreneur” Nova Covington, Goddess Garden is a woman-owned sun care company from sunny Boulder, Colorado. For every action below that you complete, you receive a specific number of entries. Click each individual action to enter yourself. For actions you have done in the past (i.e. you are already a fan of Goddess Garden Natural Sunscreen or RonandLisaTheHealthyHomeDreamTeam on Facebook) just click directly on ‘I did this’. The eligibility of the winner will be verified by The Healthy Home Dream Team®. There is no mandatory entry. Each action will earn different numbers of entries into the contest. You may Tweet or share on Pinterest, Google+ or your Facebook wall for an entry once per day. All other actions will only be counted once. After completing any entry below, look for the blue ‘SHARE THIS’ text at the top of the widget that will give you options to share with your friends. For each friend that enters the giveaway, you will receive +1 entry into the giveaway. You can refer up to 10 people and earn 10 more entry points! You must be 18 or older with a U.S. or Canadian address to win. Contest ends 6/15/13 at 12:01am ET. Click here for complete terms and conditions. 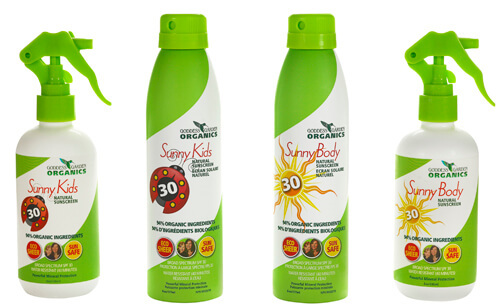 I’d like to try the Sunny Kids Organic Sunscreen Continuous Spray. I’d love to try the mint and lavender one! I like the continuous spray sunscreen or the facial protection too. Both would be great to me. I like the continuous spray sunscreen; the fact that it is natural is fantastic! I like the kids continuous spray sun screen. Much easier than slathering lotion on! I’ve been told that it takes unsafe chemicals to “particalize” sunscreen and make it into a spray. Would love to know more about this if anyone can share! I’m with Goddess Garden, and we’ve actually been working on the formula in the continuous spray for two years. It took us that long to get the viscosity just right for the sunscreen to spray out so nicely. And no, there are definitely no unsafe chemicals in our continuous spray sunscreen. In fact, there are no synthetic chemicals in our sunscreen at all, every ingredient is derived naturally. Our continuous spray sunscreen is almost the exact same formula as our tube sunscreen less shea butter. What’s even better about our continuous spray sunscreen, is that it is completely non-aerosol, so that means the spray is completely good for you and good for the planet! Please let us know if you have any additional questions. Thanks! I love the facial sunscreen that it’s mostly organic and love the kids natural sunscreen spray!! I love the Natural Sunscreen Spray SPF30 – 8OZ. I love the convenience of spray sunscreen, and it’s great to have one with physical UV blockers instead of chemical ones! I like the KIDS NATURAL SUNSCREEN CONTINUOUS SPRAY. I like the facial sunscreen! I really like the Natural Daily Lotion – Tangerine Lavender. Conserve and follow this hyperlink $10 on Motorola buds cordless headphones. Originally $69.99, now $59.99. Includes complimentary delivery. Verizon is a lot more expensive than various other providers.